Detachable arm? Sparkly pet gater? Sign me up!! I hope I made her hair fabulous enough. I swear I thought a thousand times that the Crocodile Hunter was hastening himself towards an untimely end. Imagine my surprise when it actually happened. Oh :'( I was so sad when I found out he had died. He was the coolest. If the arm is detachable- you have to make the shoes non-removable. I just can't keep track of too many parts! And her hair is def fab. "Hot water reveals bloody gash!!" FTW! Just wondering . 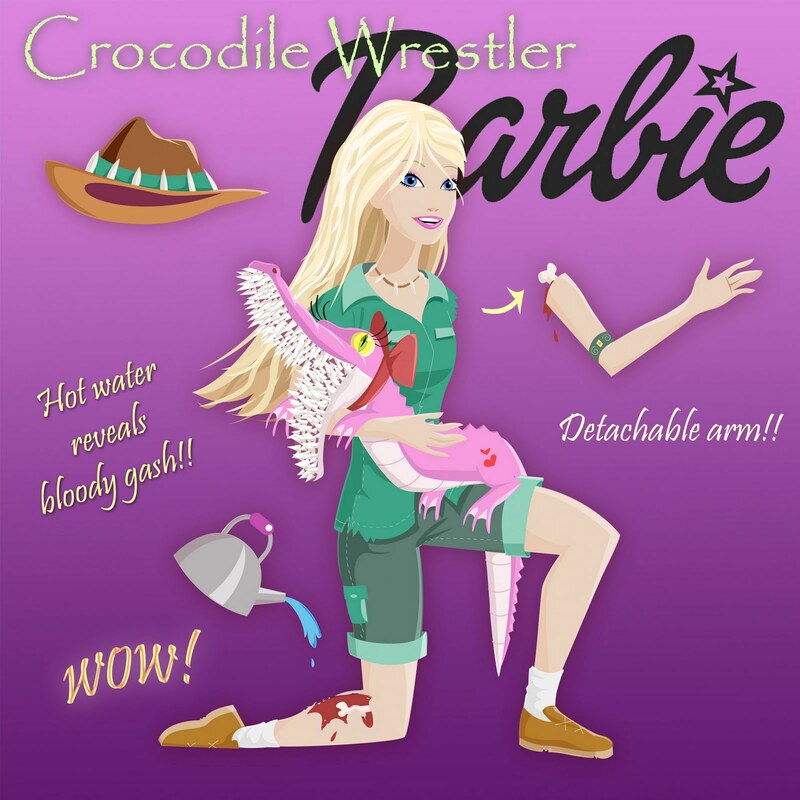 . . Do you need to attach the crocodile the arm to 'twist' it off? You know, authentic crocodile action and all that stuff. . . This brought back so many good memories–battle damage! I can't stop laughing! The croc's mouthful of teeth is so hilarious! This has got to be the coolest thing I have ever seen. It's amazing! I want one now! Sorry, I stumbled across your blog from the BYU Writing for Young Readers Workshop in the faculty section. Imagine my dismay when I discovered your Twitter account gone and no email. Alas. The fates are against me. But I am in LOVE with the idea for your novel Entwined! Seriously, email me back. I want to hear more about it. Cool that people have found me through the for readers site! I don't know if it shows up on my profile, but my email is storyboarder@gmail (dot) com. Yeeeeh…Twitter. I deleted my account a couple of weeks ago because I discovered I was thinking twitter-sized thoughts. Now that it's been deleted, I've realized that my thoughts have always been twitter-sized. This is not depressing at all! This makes me smile, so much. Heather, your humor is refreshing.